People-watching is a little more fun when you're indoors eating a quality pistachio gelato and watching all the people, gelato-less, pretend that their umbrellas are allies against a continuous downpour of rain. A little girl, who came in with her parents, had a stuffed toy snake wrapped around her shoulders (so chic!) and was holding what I thought was a toy lizard BUT THEN IT STARTED MOVING its lizardy head and feet. It turns out the fam was lizard-sitting. Lizard-sitting & gelato? That girl has it made. They kind of made my day though. "Can Zahra have her Atheist and stay Muslim too? Yup, it's just your regular everyday tale of boy-meets-girl-meets-1000's of years of religious doctrine. You may even discover you’re more Muslim than you think." There's a better synopsis of the autobiographical tale at Zahra's site, although the actual story — of a young woman who wants to tell her parents about some life-step with boyfriend of different background — is like, tale as old as time. But what really elevates the show is how Zahra really brings all her characters, especially her parents, to vivid life, with a lot of humor and love (like you totally want to go over to her parent's house for dinner and hang out with her family, especially her opinionated, hilarious dad who calls her "man" and has a great cussing style). Zahra also brings to life that weird concoction of complexity, frustration, and hilarity/absurdity involved in dealing with your puny street-bought umbrella of personal feelings against the downpour of history, tradition, and cultural expectations brought by immigrant parents. I thought it was smart to add a sort of flashback interlude on the beginning of her parents' relationship, adding depth both to the parents' characters and her own story. I also liked how Zahra portrayed how a lot of this conflict lived in her head - sure, it did actually play out in a fight with her dad, but he is the one to come up with a compromise and her boyfriend who was totally okay in participating in that compromise. Plus, hello, the show is super funny and smart. Do you like to laugh? Are you not a robot? Go see the show. It's like a couple more dollars than a movie these days and an hour long so you can go back to whatever the kids are doing these days. 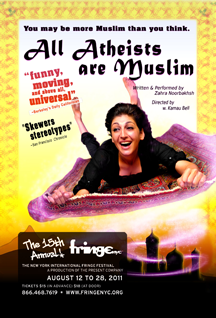 "All Atheists are Muslim" is showing for another week at the Fringe Festival and has a run in SF, land of very little summer rain and probably more artisanal fancy-pants gelato, in September.